The first step to getting the perfect set of tires for your vehicle is understanding the different types. This can be daunting, as there are so many varieties. In this article, we have broken down the different categories and types to help you on your way to tire perfection. 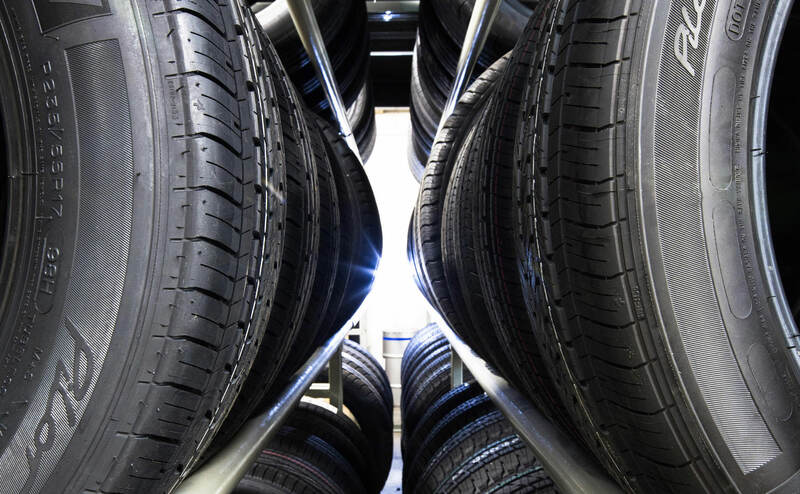 The priorities for tires made for these classes of vehicles are a smooth and comfortable ride, reliable all-season traction, and durable treads. Owners of more performance-oriented vehicles may want to choose tires that are enhanced for performance, while those of us that own more commuter-style vehicles will stick with comfort and durability. All-Season: All-season tires deliver reliable traction year-round as well as good comfort and handling on the highway. These tires generally feature symmetrical tread patterns, which provide a quiet ride, and circumferential grooves to enhance wet-weather grip. Touring: These tires are similar to all-seasons but are slightly more performance oriented. These tires are perfect for vehicles that require enhanced handling capabilities from their tires. These tires often feature asymmetrical tread patterns, which increase handling performance but can also increase tire noise. Performance: Performance tires often have larger circumferential and lateral grooves, which increase wet weather grip. They usually feature dense siping and use silica enriched tread compounds for traction. These tires come with higher speed ratings than touring or all-season tires. Summer: Summer tires are designed to increase performance during dry or wet conditions in warm weather. Solid contact patches, mild circumferential grooves, and minimal siping mean that these tires are ideal for performance vehicles in warm climates. Track and Competition: These tires deliver the pinnacle of performance. These tires are designed to be driven aggressively in dry conditions, and are therefore rarely used for daily driving. Truck and SUV tires should be equipped with the end-use in mind. For a vehicle that spends more time off-road than on-road, aggressive tires will help you stay on track. For vehicles that spend lots of time on the highway, a smoother, longer lasting tread would make the most sense. Highway: These tires are designed to be extremely comfortable and durable for long-haul trips. These tires use siping to enhance all-season grip without having to compromise on quiet. All-Terrain: Often referred to as “A/T tires”, these tires are optimized for grip on deep mud, dirt, and sand. The grip is provided by large tread blocks and more voids, and the tires often feature reinforced sidewalls to resist puncture. Although these tires will be noisier than less aggressive options, many people happily use all-terrain tires for daily use. Mud-Terrain: Similar to A/T tires, but with even larger tread blocks and more voids. These tires will be noisier than A/T tires and should therefore be chosen by people who are true off-road enthusiasts. All-Purpose: Also known as “trail tires”, these fall between highway and A/T tires in terms of ruggedness. If you can’t decide between highway tires or A/T tires, chances are these will suit you well. All-purpose tires are commonly referred to as very mild all-terrain tires. Ribbed: These are designed to deliver the ultimate performance for highway handling and long-haul mileage. Solid rib tread design increase stability and wet weather traction when moving quickly on the highway. These tires are often selected for commercial vehicles that spend most of their time on the highway. Sport Truck: These tires are similar to highway tires but are optimized for performance. Think of them as performance tires for heavier vehicles. These tires often use asymmetrical tread patterns for increased grip. Sometimes a conventional tire won’t cut it. Here is a list of specialty tires accompanied with brief overviews of why you would select each one. Winter Tires: These tires are designed to give you the best possible traction in harsh winter conditions when the temperature drops below 10C. This sort of tire is available for almost any type of vehicle. Heavy siping and deep circumferential grooves prevent snow and slush from building up on the contact patch. Some winter tires come with metal studs to increase grip, but these should only be used in the most severe of winter conditions – studded tires are also illegal in some areas, so always check the bylaws. Temporary Spares: These tires come in two broad categories: donuts and full sized. Donut spares are only for temporary use and typically have a speed cap of about 80km/h. Full size spares are the same size as the equipped tires and can be used as a replacement. Trailer: Trailer tires come in two varieties: bias ply or radial ply. Bias ply tires can carry more weight but usually have a rougher ride and are less durable than radial tires. Radial tires give a smoother ride and are great for highway driving. ATV/UTV: These tires are usually super aggressive, featuring huge individual tread blocks and voids to give the vehicle traction in gnarly off-road conditions.